Black Caviar leather Chanel CC wallet with gold-tone hardware, CC logo at front, tonal leather and black twill lining, single zip pocket, twleve card slots, dual bill compartments and snap closure at front flap. Exterior Material: Pink smooth calfskin with gold-tone hardware, single flat shoulder strap and tonal stitching throughout. Interior Material: Tonal leather interior with three interior compartments; one with zip closure, dual pockets at interior wall and push-lock closure at front flap. Condition: Good. Minor scratches on exterior. Minor scratches and discoloration on hardware. Minor wear in interior. Note: This bag has been repaired. Once your card has been authorized or your Paypal account confirmed, we will process the charges and submit the order for shipment within 1 business day. International (7-14 business days): International Standard AU returns accepted, for any reason. Shipping both ways will be charged upon return. See full details here. Customers are responsible upon delivery for any import duties, goods and services tax (GST), value added tax (VAT), customs fees and any other tax on top of the STYLISHTOP purchase price. Items made of exotic materials cannot be shipped outside the AU. No returns on international orders. We surely understand that the biggest concern to shop second-hand luxury is the authenticity. This is why we spent much attention and efforts to establish an algorithmic and a database to guarantee our high accuracy rates. 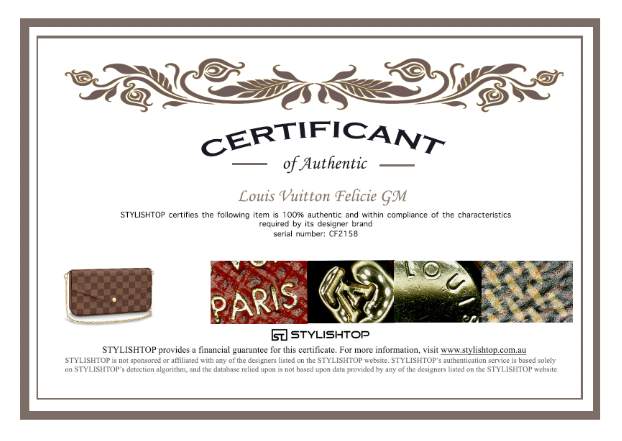 Every items listed on our website has been carefully authenticated by our specialist authenticators. Certifications will be provided for all products. On rare occasions, our advanced algorithms may not perform as expected. In order to ensure that our customers consistently have an outstanding experience, we provide certain financial guarantees. Our guarantee states that if STYLISHTOP’s algorithms fail to detect a counterfeit item and instead verify it to be authentic, we will reimburse the amount spent to acquire that item(Current Retail Price) in exchange for the item itself.